How Inspiring Special & Unique was this. Wow. This fundermentally deeply inspired me lead me to become a part of Theatrical History. I Remember Auditioning for this Role Standing before the Piano with the Musical Director The Director & The Choreographer. The Heat Is On.! I was Ready For this Role. I Was Blessed. 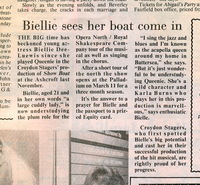 In The Hit Musical " Showboat " With The Lead Principle Role of 'Queenie' I feel Married to this Role. Working together with The Croydon Stagers Theatre Company. We Perfomed in the Ashcroft Theatre-Fair Field Halls. This was Heaven on Earth. A Fantastic Cast. The time of my life I thought. Still this was just the begining. I Remember As if it was yesterday standing talking to a friend. I Said out Loud "I Am going to Perform in the West End Theatres very very soon". He looked at me as if i was Crazy with the question mark How are you ??. I Looked At Him & Before he asked I Said "Just you wait and see"
I Heard that they were Auditioning for Show Boat In The West End. I Bought The Back Stage News Paper as it was called back then. Hello.!! I could not beleive my Eyes where was the audition then.? I Decided to act quickly & write a letter to the Associates. Can you believe it i was just on time. I recieved a letter Back Dec 15th inviting me to audition on Dec 17th. I Auditioned. Yes My Boat Sailed In. I knew the Show & The Principle Role of Queenie. Just to be clear, It was still a Tough Audition, Believe Me. Singing & Dancing up a storm. Hallelujah.!! You Got to Move It Move It.!! Plus a Tour of Great Britain. In The Grand Theatre & Opera House_Leeds, The Lyceum Theatre_Sheffield, The Play House_Edingburgh, For Opera North & The Royal Shakespeare Company with Pola Jones. (1990/91) What a at GREAT Time I Had. Hard work still Sooooooooo much fun. Laughing in the wings before going on stage. Eight Shows a Week. I Love It. I was Really Upset when Mr Bruce Hubbard Passed On..He Performed the Principle Role Of "Joe". I Cried Softly at his passing. I Love Him So.He Believed in Me & Inspired Me. Man when You Heard Him Sing just like a Song Bird wrapped in a warm Blanket. He Always Gave Me Great Hugs he was Strong. 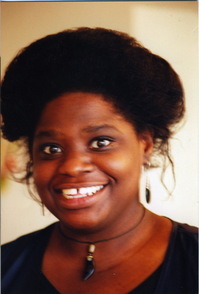 Miss Karla Burns who Performed The Principle Role of Queenie. She was so Supportive & Encouraging to me. I remember being so welcome in her dressing room. She also came to meet my Family. We Sat We ate A Lovely Meal together Nigelly my dear Theatrical friend was there. The whole Cast Was Fabulous. Only Admiration for this Lady. Sharing your time with another Soul is one of the greatest gifts i feel that we as souls can give to each other. Thankyou for your Kindness & Inspiration. Performing in the Grand Theatre & Opera House in The Hit Musical "Show Boat" would be the next key in my puzzle for it was here that i came to Audition for The Legendary Mr Billy Wilson Director & Choreographer. I Originally Auditioned for the Hit Musical "The Cotton Club" They were performing there. Madeline Bell was there to great me with a Big Warm Smile she took me to Mr Wilson. It was great to meet some of the cast. I felt like i had perfomed a whole show at the end of My Audition. He took everything i had to give. Wow. I liked his style! He reminded me of My Oldest Brother.His dress sence & His Smile. I recieved a telephone call Saying that i got the Role. Still the Lady Decided to stay on in the Show. They would call me when they had a part for me. Ok.! Two weeks later the telephone wrang. I was in the living room baby sitting my niece. Saying that they have a role for me In The New Hit Musical "Josephine" Playing the Principle Lead Role Of 'Miss Molly'. I can feel it as if it was yesterday. How I Screamed with Exhilaration. Maris was laughing on the other side of the telephone. 'Oh Yes' she said 'You do know that it is in the Netherlands & You only have two weeks before rehearsals start'. Hallelujah & Hello !!! Two weeks to get my priorities in order. I was Ecstatic. My Family Were Very Sad to see me go. Thank You Mr Billy Wilson. I remember just how difficult it was to leave them & live without them. I was the Mamma of the Family. It was Emotionally Really Challenging For Me. Makes me sad to think about it. Adjusting was Challenging & Conflicting. The reality of life We all Live. So with a lot of Courage & Faith I flew into the Next New Chapter of my life. The Netherlands - " Hit Musical Josephine"
Gallery: Miss Molly Scenes... Click here to see..!!! The Novotel was a Great place to live. Excellent Service & The Breakfast. I Loved it.! I went on to live in the Weteringschans. Together we had a big house for Me Miss Molly, Miss Carrie McDonald ,Tumpy, Henry & Margret. I Loved Riding in the trams which at first i thought was free every one just walked in & Sat down. I remember recieving a blue second hand bike & riding around the Canals. A bit wobbly at first. Mr Clarinet Man Thomas Helped Me. Still i got the hand of it quickly. Living At the Schans was great. The Shop owners & our neighbours were very friendly & welcoming. I remember one morning very early most of us woke up with the feel of the earth moving. My table moved across the room. I ran out on to the landing & saw Miss Carrie saying it is an earthquake. This was the first time i ever experienced any thing like that in my life. Wow. Rehearsals were great at the Bavos house in Amsterdam. Fun fun fun. I Love the theatre & all that comes along with it. I can Taste it. Mouth Waterin..
Mr Billy Wilson I Am so Grateful & Thankful to him. He Believed in Me Like Nobody else in my Life. He Coached Me Encouraged Me. Inspired Me. He knew exactly how to reach Me inside & Get Me to dig deep to get the best out of myself. He Made sure that i could both see & Consciously connect internally with what he saw when we met for the first time at My Audition. That I Continued to rise to The Challenges In My Life from the inside out. Important Life Lessons. I can still hear him talking to me now His affirmations & him Mentoring me. Sharing his life experiences with Me. How I Love This Man So Much. I was truly Heart Broken & Devastated when he Died. He did more than Believe in Me, He Understood Me, He talked with me to find out what moved me. How He Respected Me & Valued My Views & Talents. I Learned so much from Him about life & about Myself. By Your Wisdom. I hope that you are Resting In Peace & that you are Proud Of My Achievements. You Live on in Me. This is for sure. Every Step I Take, Every Move I make.! I also want to Thank Stardust Theatre Productions BV .Mr Henk Van Der Meyden & Ms Monica Strotmann. For Believing & Trusting Mr Billy Wilson. Thank you for Trusting Me for Opening Up a New Door that changed my life & Blessed me with all these Wonderful Experiences & Memories. Some Of The Most Happiest Moments in My Life. With Only Love In My Heart I Thank You Both. It was Delightful Working with you. May You & Your Families Continue to be Blessed With Love & Good Health. Stay Blessed. I still have this leaflet that Monica brought back especially for me from London.! I feel was very thoughtful & sweet. I went on to Play The Role Of The Sweet Georgia Peach "Miss Clara Belle Hudman" In The Hit Musical "The Glory Of Gospel " Also For Stardust Theatre Productions BV. Cant Help Loving Dat Man & Miss Ruth Jacott. I Loved seeing them. Smile.! They would always come to see us back stage. What a Lovely Couple. Wow. I really feel Very Lucky For i was once again Blessed with another inspiring soul in my Life. Who Supported me & Encouraged me to go through my own boundries. His Name was Mr Fred Gripper What a Fantastic Musician. If you heard him play. Wow. The Chords are a Marraige made in Heaven. I could listen to him play for hours. I Thank you for taking the time to Share Talk & Listen from your Heart. I appreciated your Patience Honesty & Warmth. Reminding Me that Giving up was not an Option. You Inspired Me Tremendously how I Learned so much about myself & life from you. I just could not believe it when he passed away. Silently I cried. This felt like it was a pattern in my life. The loss of Wonderful souls whom I loved. That have given me so much. Thank you Mr Fred Gripper. For Your Support Belief & Wisdom. When Mr Rufus Who could Sing Like The Song Bird Passed On I was simply in shock inside of myself. He Always Told Me I Love you Miss Biellie-Dee. I Never got a chance to say Good Bye. Memories From The Corners of my mind. Life Oh Life oh Life. I Love You to Mr Rufus. I Thank You for Singing to me during warm ups. I Thank you for Being You. My Life Was wonderfully Blessed By The Musical The Glory of Gospel. Thank You For the Moments you have given me. The Memories are all in My Mind. Miss Rhetta Hughes. You have returned Home with your Mamma to The USA. I also Thank You from my heart for all of your support & kindness. Thank You also for a lot of these Photographs. Memories Captured. You are a Wonderful Photographer. It was Fantastic Working With You. I Had the Time Of My Life. I would do it all over again.! Come On Miss Carrie.! I feel very Blessed & Inspired to have Both Written & Performed in My One Woman Show "Old Time Religion"
I Love the Concept & The Idea Which grew inside from a tiny seed within myself. I have also been able to bring my love of writting into my show. With short stories poetry & short scripts. This brought The "Old Time Religion" Journey together once combined with the Songs & music.They really breathe life into my story. Miss Marianne Stel. I Thank you for all of your musical talents & help. Most of the work went into getting the musical arrangements in order once the Script was written. Wow. 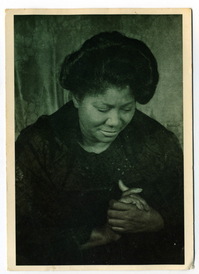 I Dedicated "Old Time Religion" To Miss Mahalia Jackson& All Thoes who have paved the way for all of us. I Thank You For Opening Doors for Me. Her One Woman Show" Old Time Religion"
I recieved a telephone call one day from a lady who was looking for someone to play the part in her show. When i opened the door & we met we both knew that the deal was done. The Tokolosh is a play Written & Performed By My Dearest Friend Miss Tanya Sprong. I Played the Role of the African Guardian Angel (The DreamWalker) 'Nokukyana' Acting & Singing African Lullabys. The African language is one which intrigues me & i also find to be quite intricate. So being honoured with this role was a blessing for me. Speaking with a South African Accent & singing these African Lullabys. This was Great i loved the challenge & the experience was priceless. For this was a wonderful soul whos soul was South Africa. This was Miss Tanya Sprongs One Woman Show. Purplepeopleproductions.! My Life was made So Much Richer just by knowing you Tarni. I was Proud to be your friend. I Thank You for being My Friend. Very Special. Miss Tanya Sprong Passed Away August 2009. Leaving behind a loving Husband & Sweet Son & Family & Friends. I Still have a challenging moments Believing that she has passed on. Yet it is true. If I Knew then what i know & Feel Now.! I Love You So Much Tarni & I Miss You Deeply. Thank you for Loving Me Unconditionally! We knew each other long before this life.! Deep River.